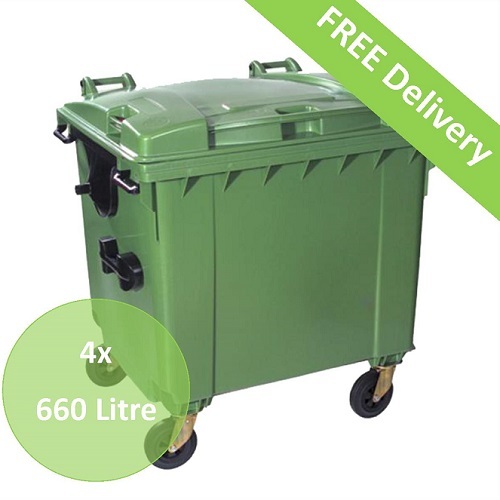 4x 660 Litre Wheeled Bins delivered on a pallet. Our wheeled bins are manufactured to the highest standards using the latest production techniques to ensure uniform wall thickness and the reinforced side walls provide strength and rigidity. The wheeled bins are manufactured from recyclable polyethylene and have been rigorously tested to withstand UV radiation, chemical resistance and extreme weather conditions. Each container features well placed, ergonomically designed handles, foot operated front wheel brakes and solid rubber tyres and is equipped with side lifting trunnions and a comb lift moulding and can be mechanically lifted by either conventional REL bin lifters or trunnion lift equipment.